This is Libby Chan, Senior Curator of the Hong Kong Maritime Museum. I notice your extensive research on Chinese export silver. 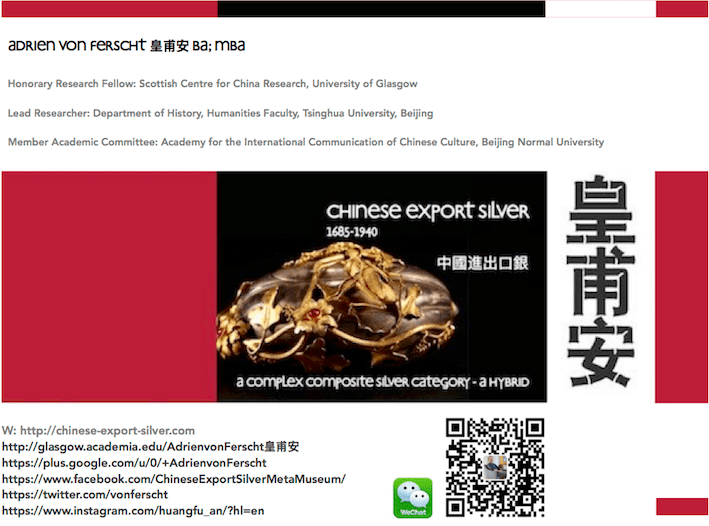 As the musuem is going to hold an exhibition on the Export Silver witht the Guangdong Provincal Museum in 2017 focusing on the Hong Kong manufactured ones, therefore, I’d like to invite you to write an article as well as sharing your advice on this subject. The Liang Yi Musuem had a silver show from V&A unfortunately I missed the chance to listen to your talk. May I know where are you based? Dear Adrien: This is James Chan, Ph.D., in Philadelphia, Pennsylvania. We emailed each other before but I lost your email address and can’t find it easily online. I have a question on an old Chinese symbol on a bracelet. You may know what it means. Please let me have your email address and I’ll send you a photo of the bracelet. James Chan, 2014 Naudain Street, Philadelphia, PA 19146, USA. Email: JamesChan@AsiaMarketingManagement.com. Tel: (267) 324-6227 (cell). Land line: (215) 735-7670. Thank you.